IT’S hard to imagine another place that rivals the north-west of Scotland for hills that remain so individually stamped on the memory. Here, every mountain is unique, outrageous shapes that suddenly rise out of nowhere, each defiantly claiming its own territory, no shared, rolling ground. Suilven, Canisp, Stac Pollaidh, Quinag; iconic peaks, evocative names. Norse legend suggests these hills of Coigach and Assynt were building blocks dumped by the gods in preparation for grander projects. There is certainly a touch of the mythical about them. It’s hard to make a continuous journey up the A835 in fine weather – it always entails a few stops, either for photos or just to stand for a minute in admiration at this ancient, chaotic architecture. Yet in some ways these hills are imposters, their stature far outweighing their relatively modest height and for that reason they probably see less boots on the ground than higher, yet more ordinary, summits. For many on their way to the Munros of Ben More Assynt and Conival, these are peaks to be admired and kept aside for another day. I am sure the same mentality applies with so many of these hills. Ben Mor Coigach, for example, which dominates the landscape just a couple of miles north of Ullapool. 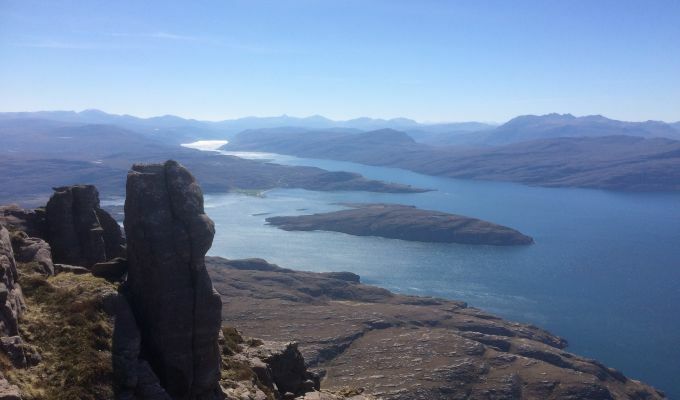 It looms into view as you turn the corner and head down to Ardmair, a great wall stretching across the horizon, the perfect backdrop for the flotilla of small white boats bobbing around where the waters of Loch Broom open out. 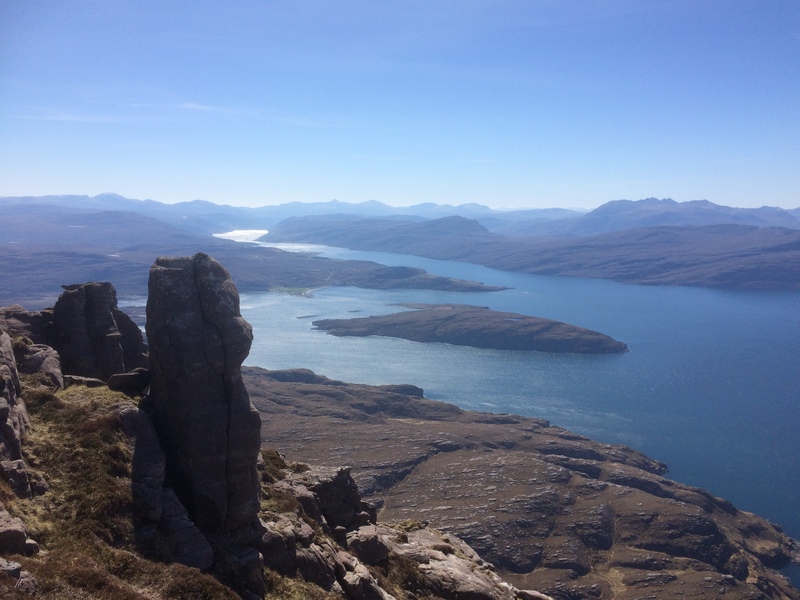 Coigach is the place of the fifths, an ancient Celtic measure of land division, and Ben Mor is the big hill. Actually, it is more the centrepoint of a mini mountain range, a complex yet tightly packed series of shapely peaks and hidden corries. The journey to its interior is a joy in itself whichever way you choose to come at it. The approach from the B-road which runs from Druimrunie along the side of Loch Lurgainn skirts the side of Being an Eoin and leads to Lochan Tuath where the outrageous rock prow of Sgurr an Fhidhleir shows its finest profile, thrusting its chest proudly to the heavens. Despite this attraction, however, the ascent from the western side is in a class of its own, a horseshoe of seven summits starting from the end of the road at Culnacraig. There’s always something special about a mountain which pushes straight up from the shoreline, a leviathan that has risen from beneath the waves to claim its parcel of land. You start with a steep climb to a narrow ridge, swing round to a perfectly framed picture of some of the country’s most iconic peaks and then finish by walking back towards the water. It feels primeval, almost inevitable, that you are being drawn back to the sea. And on a day of perfect visibility and sparkling waters, that feeling is hypnotic. Lochinver was the true start point for this adventure, the base for a week exploring these empty lands. The road round to Achiltibuie is some 36km, but a glance at the map doesn’t tell the full story. This is a twisting, teasing wild ride that even Mr Toad would baulk at, seemingly switching direction with every new turn, snaking through a series of tight contours, wending its way past inlets, round lochans of every shape and size, over high points and low points, sometimes just a few metres apart. You can see the terror in the eyes of the oncoming tourists as they try to manoeuvre their way round. There is no fast pass on the mad little road of Sutherland. And with every twist and every turn there is a new view of these individual hills. No rolling ridges here; each peak has its own identity and its own space, each defined by shapes that could have been have dreamed up by Salvador Dali in one of his wildest periods. The early light had turned the waters of the myriad of little lochs silver while the hills stood apart as dark blue shapes backlit by the spotlights of the sun’s rays. Suilven was there one minute as a massive dome, the next as the spine of a stegosaurus; Stac Pollaidh, a line of castellated towers one minute, a towering pyramid the next. No two views were ever the same. Then the road split, the right-hand branch swinging round Loch Osgaig only to switch direction again and head south to the coast at Badentarbat Bay. Lying offshore to the west were the scattered islands of the Summer Isles, spits and spots of lands breaking the continuity of the blues of sky and water. We were still some 7km from the start of the walk and already it was mesmerising. Now we were at Achiltibuie, or more precisely the string of settlements collectively known as Achiltibuie, that eventually terminates at Culnacraig. Achiltibuie is either the field of the yellow stream, or the yellow-haired boy, and is a long stretch of white buildings and old crofts that looks like it could have been frozen in time, a peaceful Shangri-La happy to ignore the rest of the world. There were a couple of cars at the start point, the occupants obviously as surprised as we were to see anyone else around. I suspect the thought of the journey round the coast puts a few off before they even start, the effort to reach hills that don’t even have the good grace to reach Corbett height a daunting prospect. We set off up a grassy track, following the line of the gorge until above the waterfall and then crossed over in a southerly direction to catch the end of the ridge. The ground leading up to the Garbh-choireachan ridge is steep and loose and sometimes hard to gain a secure foothold, in some places resembling a walk along a vertical sandy beach, but after the initial push you reach more solid ground. Now comes a series of pancake rock stacks rising vertically to the summit ridge, but in these dry, hot conditions they were a delight, giving scrambling options as hard as you wish to make them. One tower in particular provided a vertiginous photo opportunity, but it proved a little more exposed and intimidating than it first looked. The Stornoway ferry passed into view across the 45 degree angle of the ridge line, its white wake like a trailing tail to this miniature interloper of a blue canvas, while on the horizon An Teallach took centre stage amongst the jumble of peaks and ridges on display. The passage to the first summit, Speicein na Garbh-choireachan is reminiscent of a mini An Teallach with its carelessly stacked piles of sandstone standing guard along a narrow walkway in the sky. Each rise provides a fresh view, a constant supply of beautifully shaped tops, and always the sparkling blue far below. When you finally run out of towers, the contrast in terrain arrives as a bit of a surprise and a disappointment, and it’s an easy walk up a mix of grass and rough sand to the shelter cairn. Sgurr an Fhidhleir is just a kilometre away but a direct northerly drop is blocked by steep slopes, and is probably the reason that most people head out first to the pointed peak of Speicein Coinnich before making the turn to the second Graham of the day. This provided a framed picture of Stac Pollaidh through the deep gap with a couple of splodges of blue to give some extra perspective. You can always count on there being a lochan around here when you need one. I would imagine the next stretch would be rather more unpleasant in wet weather, but the continuing dry spell had given the moss an unexpected bounce, and we were soon under the soaring southern face of the Fiddler. The short rise up a tapering ramp leads to the apex, the cairn sitting right at the edge of nothingness, providing the opportunity for a few careful glances down into the void. The line of sight for the next 20 minutes is now firmly focussed on Stac Pollaidh; every curve of the ridge onward providing a slight change in profile, a rock star posing for the cameras, while the rest of the Inverpolly gang - Cul Mor and Cul Beag - hang around in the background reminding everyone that this is a true group effort. Meanwhile, Sgurr an Fhidhleir continues to impress in the rear mirror, a dark shadowy edge slashing vertically through the landscape. There’s a huge boulder standing just off the ridge, an easy scramble out to the top providing a spectacular but flattering photo opportunity. A short detour north brings you to Point 648 and another variation on the theme, this time a clear line of sight over Loch Bad a’ Grail and Loch Lurgainn. The walk over to the sixth summit of the day, Being nan Caorach, crosses a curious soft hollow where a confusion of prints going in all directions suggest some sort of deer rush hour takes place here with frequent regularity. Then it was all about the water again, the views over the Summer Isles opening out, a little more muted as hazy light cloud soaked up the sunshine on the horizon to bring a more dreamlike quality to the landscape. The smallest summit of the day, Cairn Conmheall, is only a kilometre away but at this time of day and with the lure of a cooling sea breeze waiting at the foot of the slope, it looked like much more of an ascent than anything we had tackled so far. I suspect most folk decide it is more of an annoyance by this point and that an earlier than planned drink in the Summer Isles Hotel is a better option. The drop to the road takes less than an hour, so we made our excuses and turned our backs on Cairn Conmheall, one to savour for another day. Perhaps that was why we struck it lucky down at the shore, a spectacular sun halo pulsing in whitening skies for a few minutes before the blue skies made a strong comeback. It’s hard to drag yourself away from this idyllic spot, but there’s always the consolation prize of the drive back round to Lochinver and all the constantly shifting mountain shapes in reverse. The day did provide one more surprise, though. As we lazily travelled round the Aird of Coigach we could see billows of smoke rising from the direction of Suilven. This was the beginning of seven days of wildfires in the region. Now we had to contend with fire engines and police cars, lights and sirens on full blast on this narrow thoroughfare. The plans for Stac Pollaidh the following day would have to be put on hold - the emergency services had their hands full and we didn’t want to get in their way. 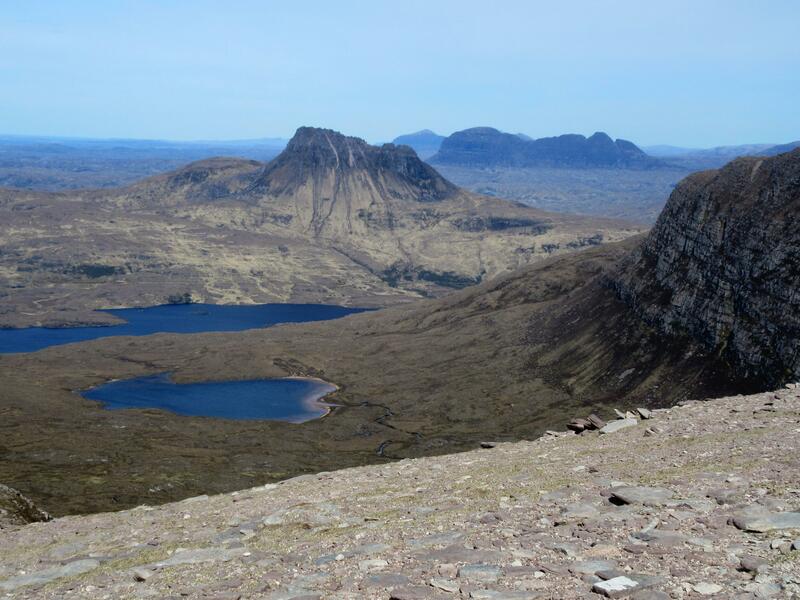 The fires had started on the south-west slopes of Suilven and quickly spread in the hot, dry conditions. During the night we were wakened around 3am by a red glow over Loch Culag. The hillside opposite was burning fiercely, sparked by embers carried on the wind, and the reflection in the waters of the loch gave the impression that it was creeping up on the house. A few hours later, in the dawn light, the fire had burned itself out, leaving a charred hillside and a herd of deer enjoying breakfast in the safety of the house grounds. The invisible fire-breathing dragon had been driven off. I’m sure the Norse gods would have approved.